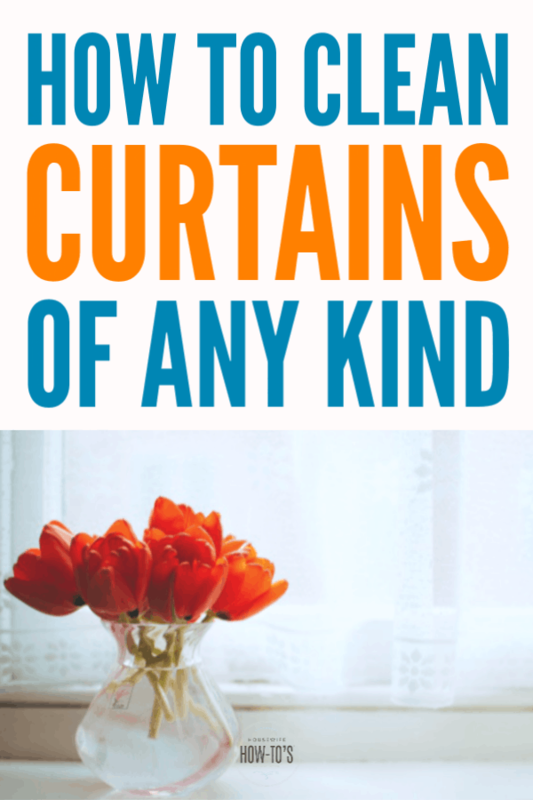 Most curtains are made of woven fabrics that gather dust, pet hair, and dander — even mold spores. Over time, these things accumulate, and your window treatments start to look dingy. Since cleaning methods vary based on your curtain material, it’s essential to identify your curtain material before proceeding. If you are unsure, stick to the maintenance cleaning instructions (described at the bottom of this post) to avoid permanent damage. Start with a seasonal cleaning then keep up with the maintenance cleaning instructions below. You’ll love how much less dust you see flying around. Wash two panels at a time on the delicate cycle using the cold setting. Dry on a low-heat setting. Immediately remove from the dryer to prevent wrinkles and rehang. The lightweight fabric of these curtains makes them prone to wrinkling and snagging when they’re wet. For that reason, it’s best to hand wash them in a sink filled with cold water and one teaspoon liquid dish detergent. Shake outdoors to dislodge dust and pet hair. Wash one panel at a time by submerging it in the soapy water for 10 minutes then swirling to loosen debris. Drain, refill the sink with cold water and swirl the panel again to remove soap residue. TIP: To restore a crisp feel to sheer or lace curtains, dissolve 1 cup of Epsom salt in a sink full of cold water. Submerge freshly-washed curtains for 10 minutes. Drain, gently press out any water but do not rinse. Let the curtains drip dry from your shower rod or laundry line and hang them. The design of these curtains makes them prone to tangling when they’re taken down, so you’ll need to wash them in place. The easiest way to do this is by hanging a bed sheet behind them — fasten it to the curtain rod with clothespins. Lay towels on the floor beneath the curtain. Fill a spray bottle with 2 cups warm water and 2-3 drops of liquid dish detergent and liberally spray the curtain top to bottom. Wipe them clean with a damp white cotton washcloth, lightly rubbing heavily soiled areas as needed. Let dry and remove the bed sheet backdrop. Some velvet curtains are machine washable while others require dry cleaning. Check the manufacturer’s label to find out which yours are. In general, lined velvet curtains should be treated as Dry Clean Only. Unlined velvet curtains require testing for colorfastness by dabbing a hidden area with a damp white washcloth. If the dye transfers to the cloth, take them to the dry cleaner. If the fabric is colorfast, wash them one panel at a time on the delicate cycle using cold water and half the usual amount of detergent. Freshly washed velvet curtains should be laid flat on a cotton sheet to dry, and never placed in the dryer. Formal or lined curtains may have a label saying they should be Dry Cleaned Only. If they’re expensive or you’re concerned about ruining them, by all means, take them to a trusted dry cleaner! If they’re old and you’ve been thinking about replacing them because they’re so dingy looking, you can try washing them to see if there’s any improvement but know that washing may ruin them, so you’re assuming the risk. If you decide to wash Dry-Clean Only curtains, do one panel at a time in the machine on the gentle cycle using cold water. Remove them from the machine immediately to keep the lining from wrinkling and then hang them on a laundry line or lay them flat to dry. Do NOT dry them in the dryer or the liner will most likely shrink. Keep your curtains in good shape between washings with the following steps. Weekly: Before cleaning a room, give the curtains a good shake to dislodge dust. Wait 10 minutes for the dust to settle before dusting furniture and vacuuming the floor. Monthly: Once a month use the dust brush attachment on your vacuum to clean curtains from top to bottom, paying extra attention to the top 5 inches where the majority of dust accumulates. Do NOT use the upholstery attachment since its teeth may snag the fabric and destroy your curtains. Monthly alternative: If vacuuming isn’t an option, you can also remove dust from curtains by running them through the dryer on a “no heat” (or fluff) setting for 5 minutes. Remove promptly and rehang to prevent wrinkles. I have large, floor to ceiling, expensive, dry clean only, thermal lined curtains. Unfortunately the dry cleaners won’t touch them because of the thermal lining, which we didn’t know when we had them made up that way. What are my options on cleaning them? They are cream and show the dirt, but still lovely curtains. I’m surprised the dry cleaners won’t do them, to be honest. After all, the label probably advises having them dry-cleaned. Not knowing what kind of fabric they are, I don’t even know what to suggest. Sorry! I have some linen type interlined curtains that need to be cleaned . Can they be dry cleaned? Yes, lined curtains should be taken to the dry cleaner. When not in use, I’d suggest carefully draping them over a padded clothes hanger. I have on lace curtain on permant folded type that you can pull up and down. On top is bergundy, and white lace on bottom they have become quite dusty. I have vacuumed some, but looks like the white part has a dingy, brownish look now. How to clean? I think I’d take those to a dry-cleaner. I’m renting a new place that had beautiful curtains hanging when I arrived. It didn’t take long to realize that they were not new and not clean. I’ve been dying to wash them, but they looked too high end to wash in the machine. PLUS it is a front loader that I did not have in my previous home and have never used a front loader (which I quickly discovered, I’m not too fond of). I googled how to wash curtains since I’d always thrown mine in the wash in the spring or dry cleaned my sheers that were in the living room. Needless to say, I’m going to end up dry cleaning these. I can’t chance ruining them. Either that or I’ll bag them and put away and buy some that I know I can wash and resume using my sheer panels that I know I can dry clean easily since I brought them from my house. Dust has a smell and I smell dust. Can’t wait to have clean window treatments! Dry-cleaning is a smart choice if you can’t risk ruining them. If it’s just dust, you could also try tumbling them in a dryer with NO heat. I have washable curtains with grommets. How should I wash them to prevent damage to the curtains and my front-load washer? I have a dryer with steam. Would that work? I think the steam might cause them to shrink. My curtains with grommets have done just fine in my top-loader on a delicate cycle, but I have no idea how they’d do in a front-loader. If there’s not a delicate cycle so you can do a cold/cold wash and rinse, I’d do them in the tub. Washing my first set of curtains as I type. I had never thought of doing it before. Great tips and I really like the topics you feature in your blog. I would love to have you post on my blog hop—the Weekend Blog Hop at My Flagstaff Home (www.myflagstaffhome.com). It begins on Thursday evenings and lasts through the weekend, if you’re interested. Honestly, I’ve never even thought of cleaning my curtains. Eww. Thanks for the tips and thanks for sharing on the Small Victories Sunday Linkup! 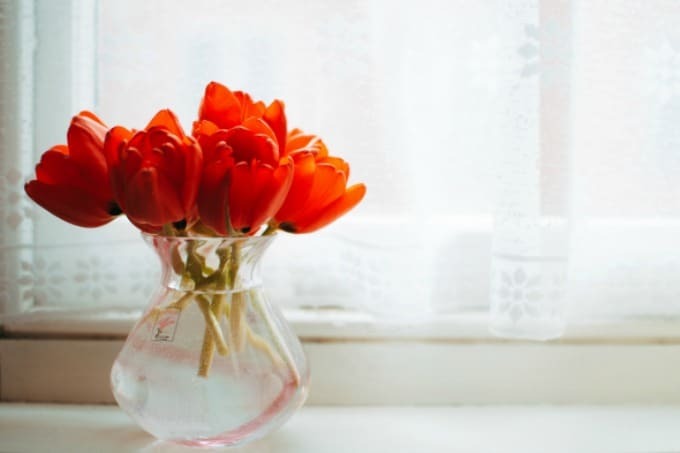 It’s pretty amazing what a difference it makes in the amount of dust in your home and, if it’s been a while, you’ll notice your room smelling better, too!